Senator Ted Cruz, R-TX, during his over 21 hour marathon speech had some wonderful heartfelt moments. One of those moments was when he acknowledged that it was nearing his young daughters bedtime and he usually reads them a story of their choosing before they go to bed. He said while they usually wouldn't choose a story from Dr. Seuss, he had the story of "Green Eggs and Ham" that was his favorite as a child [saying it was his father who actually invented the green hams and eggs dish], so he wanted to read this to his daughters this night as he knew they were watching [probably for the first and only time] C-Span2. 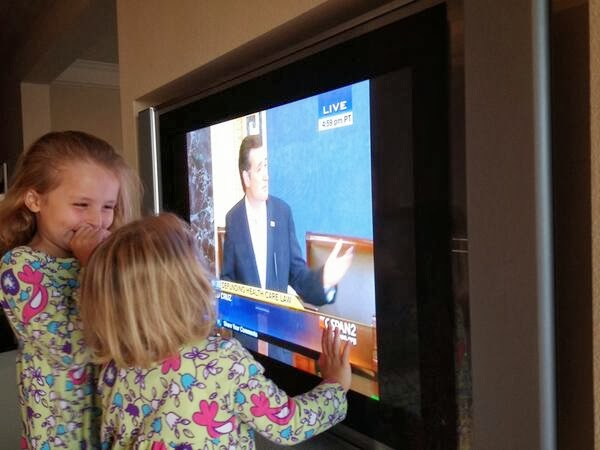 Here is maybe the cutest picture you will ever see of Ted Cruz' two precious daughters [Caroline and Catherine] watching their daddy read them their bedtime story on TV. Even a liberal, I would hope, would smile at this picture.